National Smoke-out Day fell on November 15th this year. So what did that mean for you if you were a smoker? To many, it won’t mean enough. 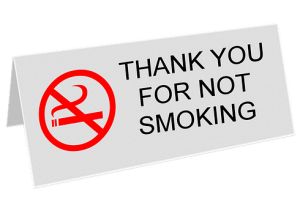 To others ready to quit smoking, it was a great time to take the steps toward quitting the habit forever. As a dentist Manteca patients turn to for their oral health needs, we implore you to quit smoking before your beautiful smile requires restorative or cosmetic dentistry. Why is National Smoke-out Day important? National Smoke-out Day is an important day for not only you, but your family and friends as well who care for your well-being. If you missed the big day, set a date of your own. The challenge is to prove to yourself that you can go 24 hours without having a cigarette. While it may seem difficult, it isn’t impossible. Trick your body into new habits. Brush your teeth as soon as you wake up to fight the craving with a clean mouth. Eat crunchy vegetables that keep your mouth moving throughout the day. Taking just one day to quit smoking means you can do the same the next day and the day after that. What does smoking do to our smiles and bodies? We all understand the effects that smoking has on our lungs. However, it is important to remember the many ways in which smoking affects more than our lungs. One of the largest problems smoking causes health problems is by impacting your mouth and oral health. Smoking is bad for each aspect of your oral hygiene; from enamel and teeth, to your gums, your bones, and your breath. The habit continually complicates your smile every time you light up. Treat yourself as a reward for quitting. Check out our teeth whitening procedures and give yourself the gift of whiter teeth. You may find that you love your new, bright smile and don’t want to complicate it by picking up the habit again. Talk with our Manteca dentist about oral health and smoking complications so you are educated and avoid problems like gum disease, periodontal disease, infections, oral cancer, and tooth loss. Check us out on Facebook if you’d like to learn more or get started today with a consult with our Manteca dentist. We’ll help you achieve your goal and make sure you have a great smile when you tell your peers and family you’ve finally quit.